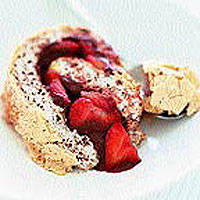 Fresh strawberries and a rich chocolate sauce enveloped in a soft-centred meringue for a light dessert. You can use other soft fruit such as raspberries or blueberries in place of the strawberries, if you prefer, just keep to the total weight of 400g. Preheat the oven to 150°C, gas mark 2. Draw a rectangle about 30 x 25cm onto a sheet of baking parchment and place on a large baking tray. Place the egg whites in a bowl and whisk until stiff. Gradually whisk in 200g of the caster sugar, a little at a time, until glossy. Finely grate 25g of the chocolate and add to the meringue with the vanilla essence. Spoon the meringue mixture onto the baking parchment and spread level with a palette knife to just fill the rectangle. Bake for about 40 minutes, or until the surface feels just crisp. Leave to cool. Chop the remaining chocolate and place in a small, heavy-based pan with the milk. Heat very gently, stirring until the chocolate has melted to make a smooth sauce. Leave to cool for about 30 minutes, or until thickened. Lightly sprinkle a sheet of baking parchment with the remaining 2 tsp sugar and invert the cooked meringue onto it. Remove the baking parchment, spread the cooled chocolate sauce in a thin layer over the meringue and scatter with the strawberries. Starting at a short end, loosely roll up the meringue. Transfer to a serving plate. Dust with icing sugar or cocoa powder and chill until ready to serve. Serve within 1 hour.